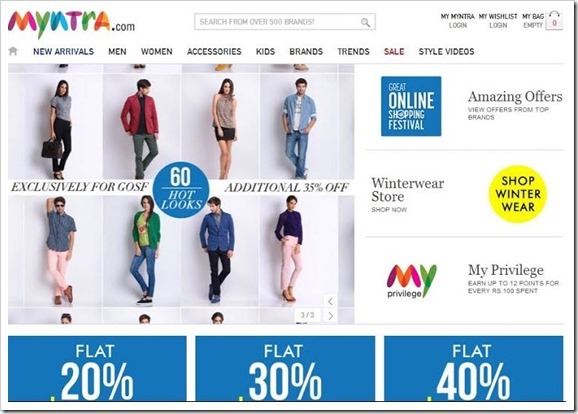 Myntra Sets Record, Sells 1 Lakh Fashion Products In 24hrs, Thanks To GOSF! So for all the brickbats GOSF is receiving, one has to agree that this Google backed event has a huge scale. Even though they have had countless issues since start of their shopping festival, the buzz around GOSF has been unprecedented. The question in everyone’s mind was whether this buzz actually transpired into sales and transactions, and looks like it did, that too big time. We just received a press release from Myntra which says that Myntra has broken all records – They have sold 1 Lakh fashion products in 24 hours since GOSF started. The 1 lakh pieces of fashion merchandize sold were in their core categories – Apparel and Footwear. With shoppers engaging in high value transactions, Myntra.com registered over three-fold increase in revenue during the 24 hour period. Myntra was quick to come out with numbers, and if this trend is seen by other portals as well, it is safe to say that GOSF, with all its issues, is a huge success! I can only imagine if GOSF improves on certain aspects as we have mentioned in this post, the response would go through the roof. So, is GOSF really becoming the Black Friday / Cyber Monday of India?